One thing all gardeners know is how important water is to a healthy garden. Water helps our plants to grow, our compost to decompose, and our planet to sustain life as we know it. It is easy to take water for granted, especially when we live in a privileged society such as America or other high-tech modern nations. Water is literally a flip of a faucet away, and boom, you have a glass of water, a hot shower, or a sprinkler to water the garden. 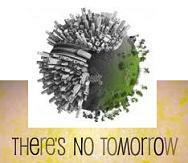 But not all people on this planet have the luxury of access to good clean water. In poverty-stricken, developing, and third world countries, clean, potable water is worth more than gold. People use the same source of water for drinking, cooking, cleaning, hygiene, sanitation, disposal, and irrigation. This mix of uses is a potent cocktail of germs, bacteria, and contamination of such a vital, life-sustaining resource. This problem of responsible water use has haunted humankind since its’ inception. For a more in-depth perspective on water and it’s role in human history, I highly recommend the book Water: The Epic Struggle for Wealth, Power, and Civilization, by Steven Soloman. 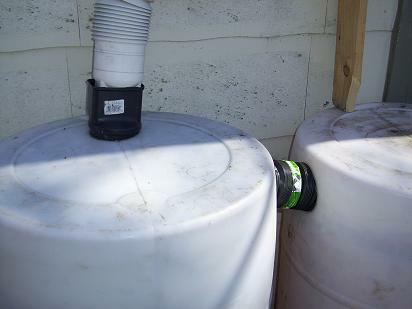 2 of the 4 rain barrels I currently use. These two hold just over 100 gallons of water. As a person from a privileged society, and as someone who is trying to walk the Earth with light foot steps, water is something I can directly have an influence on. I can choose to take shorter showers, or boycott a certain corporation or product; or I can build rain barrels. My gardens in the heat of the summer, require a lot of water. The easy way of dealing with this situation is getting enough rain. Unfortunately, getting enough rain at the right times is a pretty hard situation to rely on. Enter the rain barrel. Currently I have a capacity of about 200 gallons of water if my four barrels are filled. That sounds like a lot, but I can drain those barrels in two waterings. Gardening takes a lot of water, farming takes even more. Any amount of water that we can save ourselves from the rain, not only helps our gardens, but it also helps our wallets and our reliance on outside sources of water. Here is the L-shaped PVC spigot, threaded into one of the barrel's bungs. 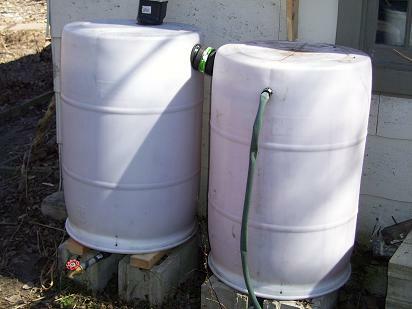 The design I have used for my rain barrels is very simple to build and requires few tools. The most complicated part of the design is putting together the spigot. I used PVC, threaded piping to build the L-shaped design. The actual spigot could be any number of different shut-off valves. The important thing to remember is to make the top of your virgin 55 gallon drum the bottom of your rain barrel. The barrels I can get have two bung openings on the top that are threaded. Using the proper sized spade bit (3/4 inch I think), drill out the center of the bung, and thread in your PVC fittings. I would recommend using teflon tape or teflon plumbers goo to help seal that connection. You can see where the gutter drains into the barrel, and how the main overflow works. Using a six-inch hole saw, cut the hole into the new top of the rain barrel towards the back. This is where the gutter will drain into you barrel. If you are building a system with more than one barrel, use the same hole saw and make a hole in the side of each barrel towards the new top, and link them together with a flexible gutter connection. 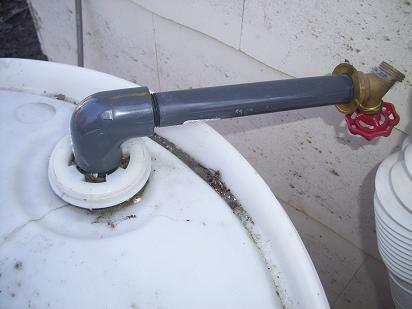 You can also add a smaller overflow to your secondary rain barrel made out of normal garden hose and a hose repair kit. There is no limit to this design. Tweak it, use materials you already have, make it better, and improve and adapt to the situation. I have seen systems similar to this that have close to twenty barrels all hooked up together. Get crazy and start saving rain water. As far as locating barrels, especially barrels that are considered food grade can be pretty difficult. Any food processing plant may or may not get bulk products in 55 gallon drums. The easiest way to find out is to call them up. Also check with your local brewery or dairy, they may have 55 gallon drums available, but maybe not food grade. Places like breweries and dairy’s will get cleaning products like caustic soda in 55 gallon drums. It is a pretty nasty chemical, but it can be neutralized and cleaned fairly easily. I hope this article is inspiring and informative. There are other sites out there that have similar designs, but they charge you quite a bit of money to get the official designs. A simple technology like rain barrels should not cost you too much money to make, especially for a design. We have a planet to take care of and gardens to water, lets not get caught up in making a profit over something like this. Happy gardening! Cheers!